Pioneers in the industry, we offer foundry ladles from India. 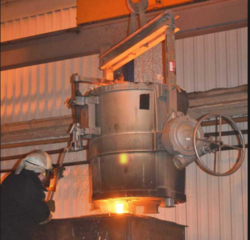 We are a prominent supplier of ladles & its bails /Ladle Preheating System/Foundry Ladles / that are used in cooler for sponge iron plant, blast furnace shell, bell & hopper and pig casting machine. These are fabricated in compliance with international quality standards at vendor's end. We offer these Ladles as per details provided by our clients at an economical price range. Looking for Ladle Preheating System ?